Pears are ideal for the baby’s first food, because they do not cause allergy and are easily digestible. 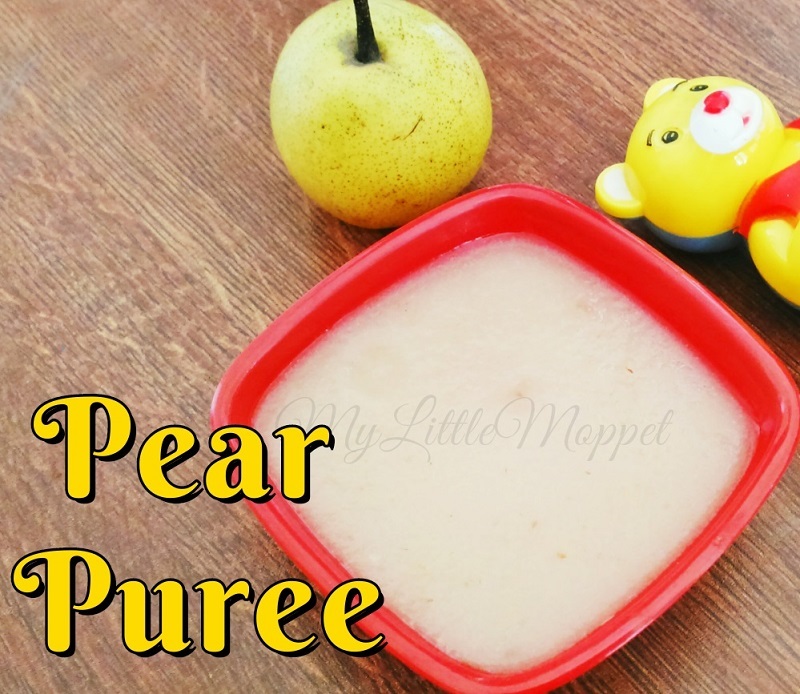 This pear puree recipe is very easy to make and tastes good too. When Can I give Pear to my Baby? They can be started in the 5 th Month. 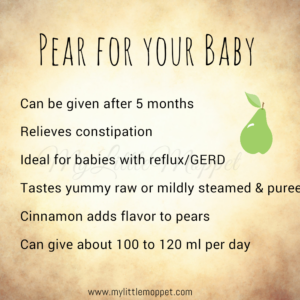 How to select pear for baby? 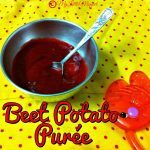 How to make Pear Puree for Babies? 1. Select a clear skinned, fresh, firm pear. Wash well. 2. Peel the skin, de-core the pear. 3. Cut the required quantity of the Pear. 4. Take a thick bottomed pan, fill with water, place the bowl with pear in it, bring it to boil,cover and cook till the required consistency is achieved. 5. After cooking the Pear either you can mash the cooked pear by spoon or masher or blend it with Blender . 6. Do not add water, add breast milk or formula feed to make it little runny. 7. Add a pinch of cinnamon to it. 8. Transfer the contents to a sterile feeding bowl and serve. 9. Do not forget to follow the 3 Day Rule for introducing any new food. Pears are rich in Vitamin C and dietary fiber. Pear is a good laxative. If you like this article, Subscribe to our Newsletter for free here to receive regular updates. We Promise not to spam your inbox!! Select a clear skinned, fresh, firm pear. Wash well. Peel the skin, de-core the pear. Cut the required quantity of the Pear. Take a thick bottomed pan, fill with water, place the bowl with pear in it, bring it to boil, cover and cook till the required consistency is achieved. 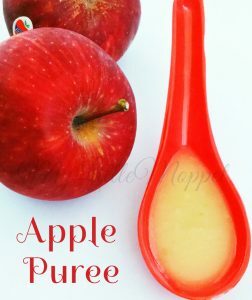 After cooking the Pear either you can mash the cooked pear by spoon or masher or blend it with Blender. 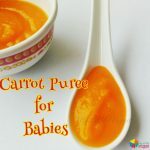 How to make Papaya Puree for Baby ? Your website is great. It helps us a lot. My 7 month old has constipation. Please help me in this issue. Also please suggest shall I give him banana or not. Ma’am; I am a working mom. I baby will be only 4.5 months old when I rejoin my duty. I wish not to feed her with bottle or formula feeds. I have sufficient breast milk and she has gained weight also. Can you guide me when to start weaning in my case and what to give her while she is in the daycare. 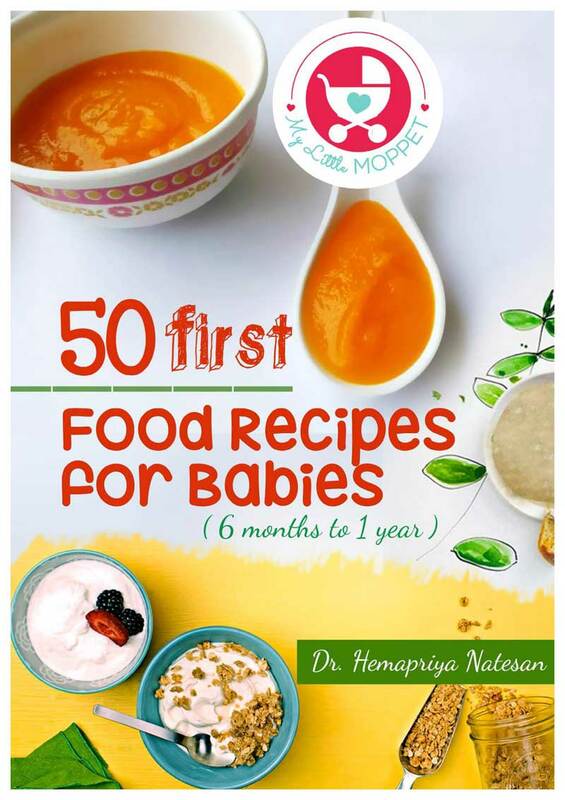 Please start weaning from sixth month, check the food chart in this website. The daycare food ideas are available and you can search for them. 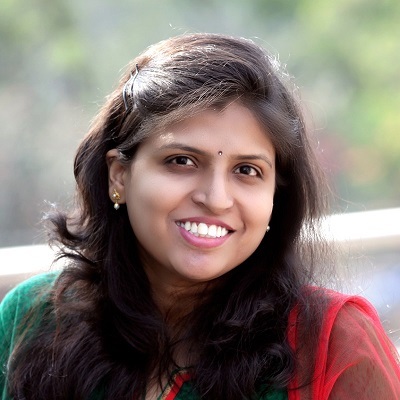 Your products and website is an awesome find and a definite keeper.  I was looking for basics to start weaning my lil one and you have been gracious to document it all in the website. I have a query which has been lingering behind my head for a while. you had mentioned abt the 3 day thumb rule while starting on new solids. But when I look at the chart, that’s applicable only during the 6th month. From the 7th month the diet chart has a well balanced and nutritious meal, but I don’t see the 3 day thumb rule applicable from the 7th month. Please can you clarify on how it needs to be and why. Can you please post a pic of how much runny meal should be prepared for a 5 month old baby? I have started solids for lo recently, but a little confused with the consistency!!!! Kindly help. 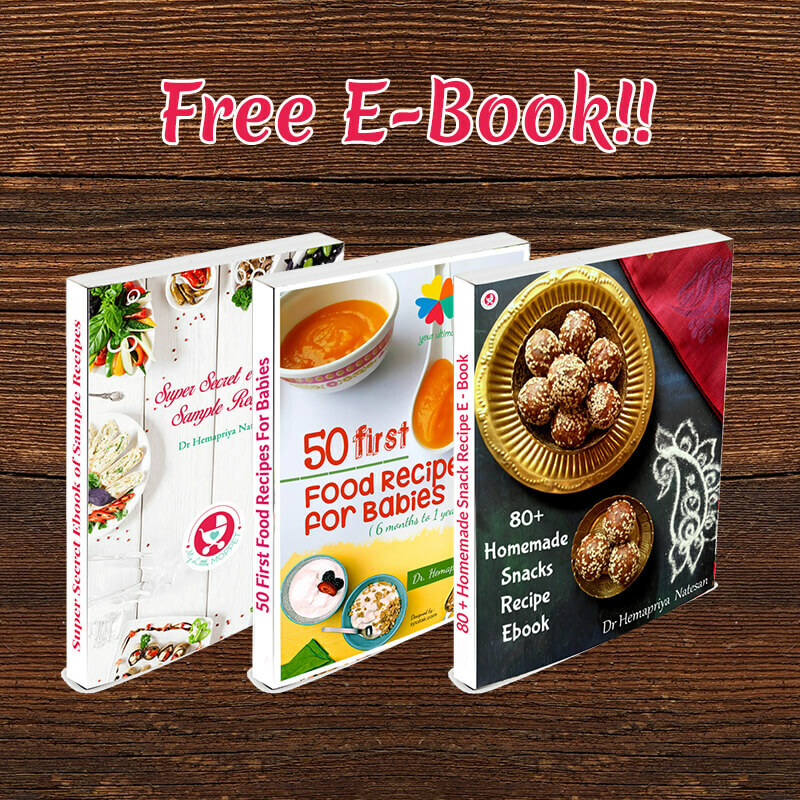 Thanks for your lovely posts and recipes. It can be runny as in consistency of our normal milk at first and slowly increase the consistency to semilsolids, will post a picture soon.